Ben Roethlisberger is set for a huge week and should come up big for the Steelers in this must have game. 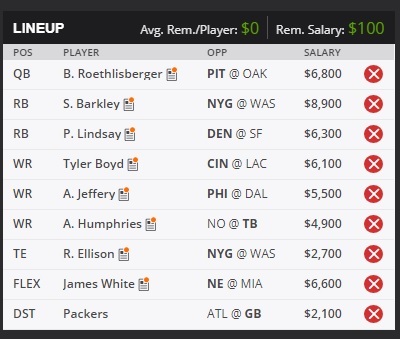 My value pick is Tyler Boyd, look for him to see double digit targets. My sleeper pick is James White, excellent match up. 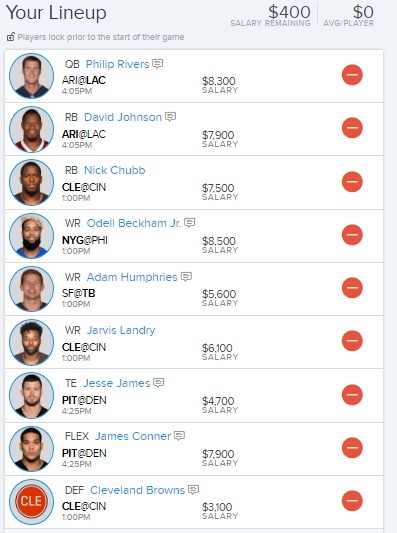 I also like Saquon Barkley to continue to be worth the salary this week. 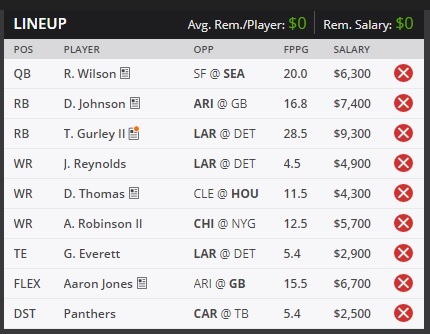 Russell Wilson is a great option this week as he tries to get the Seahawks into the playoffs. 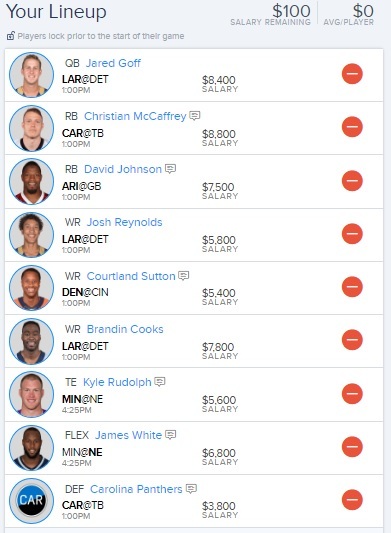 I like David Johnson to be a great value this week, along with Josh Reynolds. My sleeper pick is Aaron Jones, he should be in for a big week at home. I also like the Panthers defense to bounce back and come up big on the road. Jared Goff comes into this week as hot as a QB can get and will continue to put up big numbers this week. My value pick is Josh Reynolds, he is a great option against the Lions as well. My sleeper pick is the Panthers defense, they should be focused in their road match up against the Bucs. I like Christian McCaffrey to have a big workload and have another monster week in this game as well. 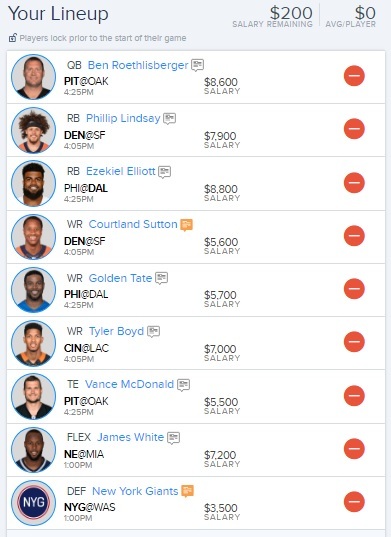 Philip Rivers is the best choice you have this week and you should build your lineup around him. My value pick is Nick Chubb, he should have plenty of touches against the Bengals. My sleeper pick is Adam Humphries, great match up against an under performing 49ers defense. I also like David Johnson to continue he solid streak against the Chargers.